"Love has nothing to do with what you are expecting to get - only what you are expecting to give - which is everything." Express your love with rings of ageless Fossil Ivory. Our Fossil Ivory Braided Edge Wedding Band or Commitment Ring is an unbroken circle of Fossilized Ivory lined with a Sterling Silver or 14KT Solid Yellow Gold inner ring. Nestled on one side next to the Ivory is a continuous wide braided rope of Sterling Silver or 14KT Gold. The inner ring also comes up the second side of the Ivory circle for durability. Shown in Fossil Walrus - Medium Light Ivory With Some Crystalline. Of course, handmade especially for you in our studio. These rings are not returnable. 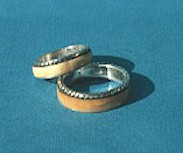 Together through the ages: When you purchase two of our Wedding or Committment Bands, both bands will be made from the same ancient piece of Fossilized Ivory.